A wonderful separate issue nautical chart of the entrance to the Potomac River. Potomac River Sheet No. 1 From Entrance to Piney Point. 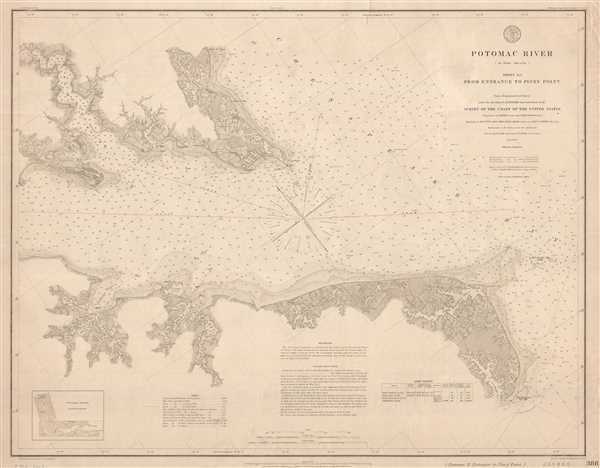 This is a separate issue 1877 U.S. Coast Survey nautical chart or maritime map of the entrance to the Potomac River on Chesapeake Bay. The map depicts the region from Piney Point to the Chesapeake Bay and from Point No Point on Chesapeake Bay to Fleet Point and Cockrell Creek. Highly detailed, myriad depth soundings, measured in fathoms, are present throughout. The coastline is illustrated in detail as well, with depth soundings indicated in the Yeocomico River, the Coan River, Smith's Creek, St. Mary's River, and St. George's River. Hull's Creek, Cubitt's Creek, the Little Wicomico River, and Judith's Sound are among other coastal features that are illustrated but do not contain depth soundings. Four lighthouses are labeled throughout the region, and a table offering general information about each lighthouse is situated along the bottom border. Information concerning soundings, sailing directions, and tides are also included along the bottom border. This map was originally published under A.D. Bache, one of the most influential and prolific figures in the early history of the U.S. Coast Survey, in 1868. This edition was issued in 1877 by Carlile Pollock Patterson, the Superintendent of the United States Coast Survey from 1874 until 1881. Very good. Even overall toning. Closed tear extending one inch into printed area from top margin professionally repaired on verso. Close margins on right side and bottom. Blank on verso.